The 2018 Europe Youth Top 10 officially opened in Vila Real, Portugal on Friday 7th September and while there were strong starts from the top seeded players in the two junior events, day one also hosted a few notable surprises. Last year when the event was held in the English city of Worcester, Rares Sipos had to settle for a ninth position finish in the Junior Boys’ Singles tournament. However, three opening victories including a strong outing against fellow Romanian and defending Champion Cristian Pletea (11-5, 7-11, 11-6, 5-11, 11-2, 11-6) sees Sipos off to a bright start one day into the 2018 tournament. Joining the top seed on six points is France’s Irvin Bertrand and Italy’s Matteo Mutti with the latter player dropping just a single game throughout the course of the day, recovering from an early deficit to see off German opponent Kay Stumper (4-11, 12-10, 11-9, 11-6, 13-11). Seeded fifth for the competition but Russia’s Lev Katsman slumped to two unexpected defeats on the opening day in Vila Real while the player seeded one position lower Maciej Kolodziejczyk of Austria heads into the second day of action searching for his first win. Sabina Surjan couldn’t have asked for a better start to her Junior Girls’ Singles campaign with the Serbian competitor emerging victorious in all three of her day one fixtures. Accounting for fellow compatriot Tijana Jokic and Portugal’s Celia Silva, top seed Surjan rounded off the day with a win over Croatia’s Andrea Pavlovic (9-11, 7-11, 11-8, 11-8, 11-9, 11-7) to claim six group points. The lowest seeded player in the draw but Celia Silva was responsible for a huge upset with the host nation representative pulling off a fine comeback to beat second seed Anna Wegrzyn (7-11, 8-11, 11-7, 11-5, 11-8, 6-11, 11-5). Franziska Schreiner, Andreea Dragoman, Tania Plaian, Tijana Jokic and Anna Wegrzyn sit just one point off the pace with five points each. Myshaal Sabhi and Simon Belik, France and Czech Republic, lead the way in the Cadet Boys’ Singles event after the second and fifth seeded players successfully negotiated their opening three encounters but there was a day one stumble for no.1 seed Maciej Kubik, who lost out to ninth seed Ivor Ban (11-6, 9-11, 13-11, 9-11, 11-7, 10-12, 11-7). 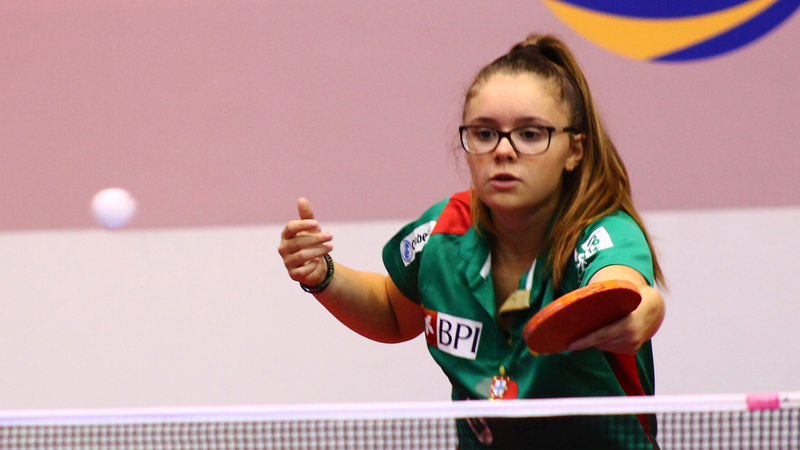 Making history earlier in the year when she became the youngest ever table tennis player to compete at a Commonwealth Games, Anna Hursey achieved a major feat on day one of the Cadet Girls’ Singles tournament in Vila Real with the Welsh star thundering to a straight games victory over European Champion Elena Zaharia (13-11, 13-11, 11-7, 11-9) in one of the biggest upsets of the day.